TO SEE MORE OF THE COVE CLINK ON THE LINK BELOW. "The Cove' is located in the Sequoyah Village area of Laurel Valley in Townsend Tennessee. From the time you enter the drive, surrounded by huge, moss covered limestone boulders, you will know you've arrived at a very special place. Never before have we seen a setting so perfectly designed by Nature to embrace a small cabin. You'll find high quality decor, linens, towels, and everything you could want to make 'The Cove' your perfect home away from home in the Great Smoky Mountains. It is our goal to create a tranquil and serene setting that will help our guests to unplug and to enjoy the spirit of the mountains and the wildlife that lives here. Don't worry, we've provided TV, Wi-Fi and Phone, just in case you can't give up the gadgets totally. 'The Cove' is decorated in a primitive theme to match the beautiful interior of hand-hewn logs. Nothing says 'mountain cabin' like a warm evening by a crackling fire; so, during the season, enjoy the warmth and sounds of the real, wood-burning stacked-stone fireplace. The kitchen has all the comforts of home, with everything you might need to cook full meals - or to nuke a burger. If you love to grill out, we have furnished you with a gas grill for those steaks you get at the local IGA. The huge indoor jetted tub will pamper you before you slip into the king-sized bed for a great night's sleep. Luxury linens, towels, pillows and blankets are all supplied. There's a walk-in closet to store the extra 'stuff' you brought along. 'The Cove' offers a park-like setting, surrounded by moss-covered limestone boulder outcroppings like those along the Little River in the Park. Catch a glimpse of 'Woody' woodpecker, or a red-tailed hawk as it navigates through the hardwood trees surrounding the cabin. Be on the lookout for the occasional black bear that wanders through the property. 'The Cove' is VERY motorcycle friendly! The access is easy and paved. Plenty of flat driveway parking. If you're a rider, you'll find Townsend to be a paradise. Every year, thousands visit the area to take advantage of these mountains and the day trips they offer and 'The Cove' offers a terrific home base for these trips. From 'The Cove', you're only a few short miles from the Cades Cove entrance to the National Park. While staying here, the Park is your playground. No matter what you like to do during the day, we hope you'll enjoy retreating to peace and warmth of 'The Cove' at day's end. 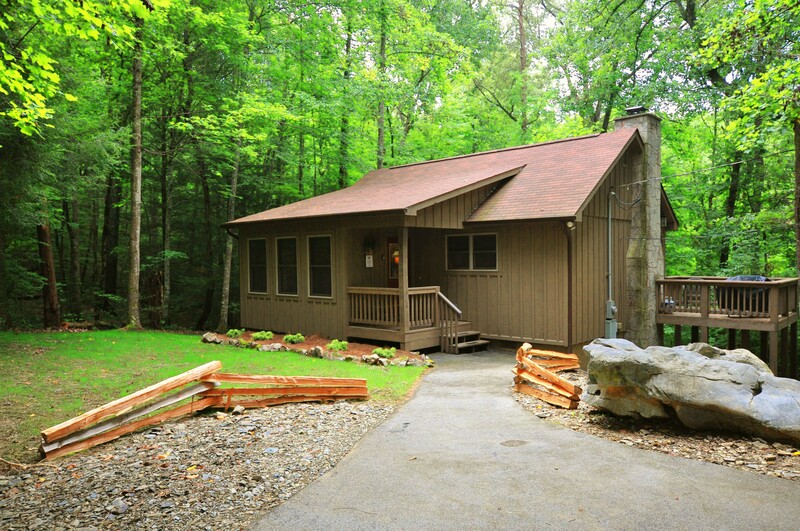 It is our hope that you will come to consider 'The Cove' YOUR home in the Great Smoky Mountains. We hope to see you soon. If The Cove is not available for the dates you are looking for, see also Smoke Rise or Wildwood, our newest cabin addition just added October 2015. All available on VRBO.